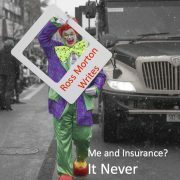 Since Ross first edited and wrote for Life Office Management Association publications and then the historic Canadian Journal of Life Insurance, his unique style of opinionated and straight to the point writing has garnered continued exposure in 38 countries. The topics ranged through management, reinsurance, underwriting, technology and general insurance insight. Each of his contributions took a unique view of the issue and formulated an article full of industry anecdotes and humorous meanderings. I wrote the following article as it was part of a presentation I did with the great Don Frost at the January 1983 Cholua Seminar. In a recent search of my archives for background material for a book I came across the article. After reading it I felt that today’s underwriters should read it as a history lesson. Today’s leadership should read it to show that some things change for the worse — the lack of meaningful industry statistics on what is issued standard, substandard or declined. The CLHIA to my knowledge has dropped the industry stats for some years leaving an underwriting leader wondering “is my company rating and or declining more than the industry average?” Or then again who cares. For the past three years I have heard from many large advisors (large by size of the clientele not their waistline) and MGAs that rated cases are few and declines are many. I have even had a senior underwriting leader say it is irrelevant as the key to today’s underwriting leadership is to get the standard through as quickly as possible. There seems to be less competition be it from insurers or reinsurers for the case that is not quite standard. 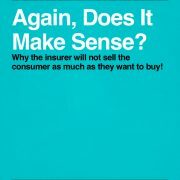 The last time that complacency was around there were challenges to our right to underwrite! Continue reading Financial Underwriting, Why Bother? A 2011 opinion on the relationship between advisor and underwriter. Many many years ago I wrote an article for the now dormant Marketing Options magazine (dearly missed by all while fondly remembered by writers and readers) about the conflict often created by miscommunication or no communication between advisor and underwriter. Thus, to say that the seemingly constant battle to get a life or living benefit insurance application through the mysterious and far from transparent new business department is new has not been around for long. Like most Canadians the advisor has a short memory (just look at how we continue to elect politicians who mere months prior to election screwed us royally) and the underwriter is not paid to remember so they never stored the historical perspective anyway. This chasm of misunderstanding, poor communication and lack of empathy between two integral parts to getting premium in the door to keep the life business going strong is not new but merely in an exaggerated state unseen in intensity in the last 41 years. Okay they were not in a boat but rather on a stage in Toronto in front of a couple of hundred underwriters and those that love to hang around underwriters. It was the one part of a two day meeting that I really wanted to see and hear even though the meeting overall conflicted with other travel and client commitments. I thought it and lunch would be worth the day’s admission price. I was able to slide into the back of the room just as the session started and tried to stay as conspicuous as possible by remaining standing. Regardless of the title they put on their presentation it was to me a chance for the three key disciplines in our business to explain why we are in the position we are today. You could say we are not in great shape or you could boast we are in great shape. It is the old “the glass is half full or the glass is half empty” comparison. I was very curious if the three would meekly state their case and slyly point the finger of blame at the other two or would there be challenging and perhaps even derogatory innuendo thrown freely. I knew the actuary and the underwriter so I did expect a feisty session. Surely someone would address the appalling state of customer service in the industry today as advisor and even customer scratches their head in confusion over the new business service experience. Sorry let me correct that since the service for the “vanilla” case clear of even a facial blemish does slide through unencumbered by restrictive and confusing underwriting as recounted to me for the past two years by numerous advisors and MGAs.